HONOLULU (13 Oct. 2015) After a closure that lasted more than two months, Hawaii’s longline vessels can fish again for bigeye tuna in the waters surrounding the Hawaiian Islands. Since Aug. 5th, the 145 active vessels in the Hawaii longline fleet have been prohibited from catching bigeye tuna in the Western and Central Pacific Ocean (WCPO), i.e., waters east of 150 degrees West longitude. The National Marine Fisheries Service (NMFS) determined that the fleet had reached its 2015 US bigeye tuna limit of 3,502 mt, developed by the Western and Central Pacific Fisheries Commission, to which the United States is a party. 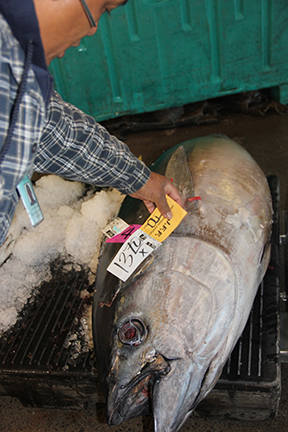 With limited supply during the closure, prices for bigeye tuna (`ahi) skyrocketed at the Honolulu fish auction. At $13.70 a pound, this 214-pounder was worth nearly $3,000 off the boat. Today, the National Marine Fisheries Service (NMFS) announced through the Federal Register that the Commonwealth of the Northern Mariana Islands (CNMI) has a 2,000 metric ton (mt) catch limit of longline-caught bigeye tuna and can allocate up to 1,000 mt each year to US longline fishing vessels in a specified fishing agreement that is consistent with established regulations. Additionally, NMFS notified CNMI Governor Eloy Enos that an agreement between the CNMI and Quota Management, Inc., of Honolulu is consistent with the regulatory requirements. The news was especially welcomed for approximately three dozen Hawaii longline vessels that are larger than 24 meters in length. These larger vessels have been banned from fishing not only in the WCPO but also in the Eastern Pacific Ocean since Aug. 12, 2015. According to another international agreement to which the United States is a party, the US longline fleet has a quota of 500 mt in EPO after which US longline vessels less than 24 meters in length only can operate in those waters. “The US longline fleet had not increased its effort,” noted Kitty Simonds, executive director of the Western Pacific Fishery Management Council, “but it experienced a bumper crop of bigeye, apparently as a result of the El Nino weather.” Simonds also noted that the majority of the bigeye tuna is caught in the equatorial Pacific, far from the Hawaii fishing grounds, and no other country has reached its quota. 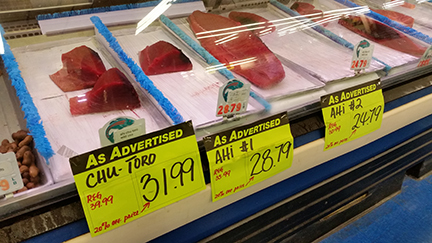 In a few weeks, after vessels provision and return from fishing, consumers of locally caught sashimi-grade tuna should see a relief from the high prices (reaching nearly $40 per pound for chu-toro, or “ahi with fat”) at retail outlets. Filets comprise about half the weight of a whole fish. The Hawaii longline fishery is unique. The fish are packed in ice and brought fresh to the dock for mostly Hawaii consumption. Only 3 percent is exported. The value of the fish landed by the Hawaii fleet is about $100 million, resulting in the port of Honolulu consistently ranking among the nation’s top 10 ports in landed value, according to the NMFS Fisheries of the United States annual reports. The five Commissioners who represent the United States on the Western and Central Pacific Fisheries Commission will meet in Honolulu tomorrow and Thursday with its advisors, known collectively as the Permanent Advisory Committee (PAC). Among other items, the PAC will provide the Commissioners with input and advice on issues that may arise at the Commission’s next meeting to be held Dec. 3 to 8, 2015, in Bali, Indonesia. To learn more about the causes of the closure and its impact on Hawaii’s fishing community and consumers, go to https://www.youtube.com/watch?v=3NMG4v_SVn0. For the Federal Register notice of the Permanent Advisory Committee meeting, go to https://www.federalregister.gov/articles/2015/08/19/2015-20523/permanent-advisory-committee-to-advise-the-us-commissioners-to-the-western-and-central-pacific.